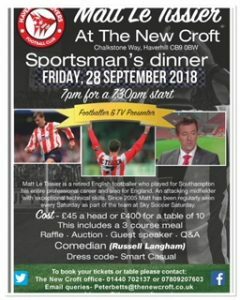 The New Croft would like to welcome you all for a fantastic Sportsman’s Dinner Evening with Matt Le Tissier. Ticket price includes 3 course meal auction and comedian. To purchase tickets please contact Sophie Grey on sophiegrey@thenewcroft.co.uk or 07809207603.